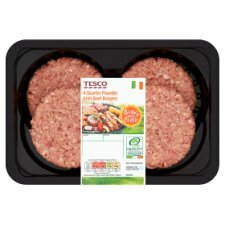 Irish Beef burgers with seasoning. Defrost thoroughly for a minimum of 12 hours in the fridge. Once defrosted use on the same day and do not refreeze. Grill: Medium 12-14 mins. Place under a pre-heated medium grill for 12-14 minutes, turning occasionally. Allow to rest in a warm place for 5 minutes before serving.